The best in The best days of their lives… so far English culture is larded with references to schooling and education. From Tom Brown’s Schooldays to Grange Hill, from Malory Towers to Waterloo Road, from Stalky and Co to Press Gang, all of human life – in miniature people form at least – is there… in all its dramatic glory. When choosing where one’s child or children will go to school, however, drama is the very last thing one wishes for. Education has become, in some regards, a politician’s plaything; the nature and outcomes of all our children’s education has been, with the best of intentions, changed and changed again. So how exactly can one go about obtaining the very best education for one’s children, where is it to be had and what are the contributions which schools can make to children and wider society? Those issues, amongst others, are what this magazine seeks to explore. Printed by: Pensord, Blackwood www.pensord.co.uk Reproduction in whole or in part prohibited without permission. of classification, run by the pupils for the pupils has long been our aim; modern and dedicated Art and Science facilities have also been on the wish-list for many years. But, it is the area of IT which presents some of the greatest and most exciting opportunities. Tablet and Touch-Screen technology is here to stay. Many of our children are already familiar with this medium and it is vital that we embrace it in our classrooms. The age of the IT suite is behind us, as this technology, both PC/ Laptop and Tablet, should be permeating every area of the curriculum during every lesson of every day. Even in the music room, where traditionally Buckholme pupils have excelled without the influence of digital technology, there will be opportunities for them to explore composition and recording using the latest child-friendly software. We are confident that our school of the future will be hi-tech, secure, user friendly and altogether a first class environment for learning. Of course, some things will not change, like the expectation that every child will reach their full potential, and the school's motto, 'Happiness through Education, Education through Happiness', will be upheld. Whatâ&#x20AC;&#x2122;s your next move? If you have a very bright child, you may be able to get a good deal of financial help with fees from many independent schools. team bus, the after match refreshments, the walk to the sports field all develop close social links that last through life. These, based as they are on the very positive attitudes associated with school sport, make a difference later in life. From time to time there is discussion about what makes the difference in Independent Education. There are many answers but towards the top of the league would be that very many such schools have a very active approach to sport. That sport develops the attitudes and 'soft' skills discussed above. Link that to the fact that when I speak to Old Boys' of my school they invariably say those soft skills are what makes them successful (the qualifications they got are the passport to their future lives, not the roadmap) then it is clear that developing young people through sport can and does directly change whole lives. So there is no doubt sport can keep you physically fit and perhaps add years to your life. But it can also, by the attitudes and skills picked up through sport, add quality to those years by promoting a healthy mental approach to life and so produce well-rounded young people able to contribute to their society. t Philip Britton MBE, is Headmaster of Bolton School and a member of the HMC (Headmasters and Headmistresses Conference) Communications Committee. He is also Vice President (Education) of the Institute of Physics. Are you investing in your childrenâ&#x20AC;&#x2122;s future? of a beginners’ recorder or violin group, or of a professional orchestra. Learning an instrument properly without forcing it (including the voice) enables one to listen dispassionately, thoughtfully, critically (in the word's best sense) and reflectively. And good musicians will always need good audiences. 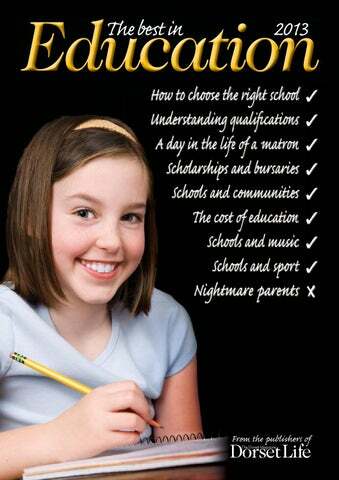 If you want your child to take grade exams, fine; they are not compulsory and they are not trophies. Grade 8 may just mean that you have made a diligent child – who wanted to please – work hard. That, of course, is a good thing in itself, but music is much more than an exam result: it is a brainand-emotion-training foundation for life. Our world needs resilient people who can work in a team – or indeed lead it. Instrumental tuition – and the opportunity to play in a group, any group, builds those qualities. Excellent Education Enriching Environment At Yarrells, we combine academic study with sport and the arts to achieve excellence in every childâ&#x20AC;&#x2122;s education. The school is set in beautiful grounds where pupils enjoy the benefits of woodland, gardens, playing fields, swimming pool and tennis courts. Children gain the advantage of a head start in the Early Years, culminating in a dynamic and successful study programme for pupils aged 11+ to 13. Pupils thrive at Yarrells and we are ambitious for every child. Schools and their communities C\fN`ebc\pcffbjXk_fnjZ_ffcjZXeXe[j_flc[`ek\^iXk\n`k_ k_\`icfZXcZfddle`k`\j Wherever your child goes to school, whether in a quiet rural setting, or in the bustle of a large town or city, it is vital that their school is embedded in the wider community around it, so that pupils develop a sense of belonging to, as well as responsibility for, the world around them. There are lots of ways in which good schools build links with the community around them. To my mind, the most effective is the creation of local school partnerships which bring together pupils, staff and parents from across the sectors. School partnerships run on good will as much as they do on funding. The returns on time and energy invested can be inspiring. Our city is blessed with excellent schools, both state and privately funded, all benefiting from the strong sense of community that characterises the city. The local Independent State School Partnership (ISSP) has been running since 2007. There are currently ten schools actively involved (three independent, five state maintained and two academies) and who jointly fund the scheme. Pupils can study Russian to GCSE level and Thinking Skills at AS level; there have been conferences on leadership, choral workshops and enterprise projects. Annette Aylett, who coordinates the ISSP programme, says that the strength of the partnership lies in providing exciting opportunities. continues to share much with older independent schools, including the pursuit of academic and extra-curricular excellence, but it is not bound by tradition. Bryanston is proud to be a forward-thinking and outward-looking school, and to continue to fulﬁl the founding vision. was formally adopted in 1979 and was a gift from alumni. The school celebrates eighty years at its beautiful Iwerne Minster site this year, and the Clayesmore family is currently made up of almost 700 pupils aged from 3-18. the school’s ethos and of the high standards which pupils strive to achieve. The school motto, ‘Happiness through education, education through happiness’, clearly describes the school’s belief that children will only learn and achieve their full potential when they feel happy and secure. derives from the assumption – later disproved – that ‘Cheneford’ (the Domesday form of Canford) meant ‘Oak-treeford’. It remains, however, a suitable emblem for a school, with its associations of growth, strength and endurance. only that if something is worth doing, g it is worth doingg well, but also that it is worth doingg it in the right frame of mind, one which is positive, outgoingg and cheerful. a winner. The chosen entry came from Mabel Taylor, who suggested the motto, ‘Where tomorrow begins’. With a hiﬆory dating back to 1707, Warminster has its feet firmly rooted in tradition, but its eyes to the future. today’s crest. Although there is no school motto, each of the school’s four houses has a Latin motto: Quantocks, victor omnium (conqueror of all); Brendons, superabimus (we will prevail); Mendips, nobis conﬁde (count on us); Blackdowns, semper coniunctim (always together). variations on the logo since the school was founded in 1858, it has always been based around the oak tree and now incorporates two acorns to represent the school’s nursery – the Little Acorns. hence the castle on the crest. The fleur de lys represents a young plant, but can also illustrate the Holy Trinity, and symbolises perfection, light and life: ideal for a school which aims to give its pupils the best start to their educational and social lives. BCS logo very appropriate, given the school’s coastal location, but it goes much deeper than that. There are three characteriﬆics of dolphins that stand out particularly: friendliness, playfulness and intelligence. That is how BCS like to think about their school, too. the values of strength, endurance, teamwork and individual responsibility, gave rise to the Olympic y flame and in turn inspired the School motto – ‘Fair is the prize and the hope is great’ – and emblem. These values still underpin Sherborne Girls today. The Sherborne Prep dragon originates g from the coat of arms of Edward VI, who founded Sherborne School. The Prep was first established in 1858 as a junior house to Sherborne School. aďŹ&#x20AC;ection by all. The schoolâ&#x20AC;&#x2122;s founding ethics of scholarship, responsibility, respect and hard work in an atmosphere of fun and enjoyment are as strong today as when the school opened in 1950 and results in a forwardthinking school with traditional values. or â&#x20AC;&#x2DC;YaďŹ&#x201E;eâ&#x20AC;&#x2122;, is on the crest, and the call of this striking bird rings out over Yarrellsâ&#x20AC;&#x2122; treetops, cheerfully symbolising the schoolâ&#x20AC;&#x2122;s passion for its natural environment. Yarrells, set in beautiful surroundings, offers educational inspiration within an enriching environment.    â&#x20AC;&#x2DC;Honour before Heath academic honoursâ&#x20AC;&#x2122;, reďŹ&#x201A;ects the excellence goes importance placed hand in hand on the development with principles. of the character and Pupils leave values at the school. the school as Founded in 1886 as knowledgeable a Church of England and considerate school by pioneer Mary young women ready Broad, the school has to make a positive stayed true to its vision of contribution offering â&#x20AC;&#x2DC;first-class liberal to society. extensive playing fields, allotments and woodland walks complement the modern sports facilities, including a full size all-weather pitch, and classroom areas. The school motto, â&#x20AC;&#x2DC;You can because you think you canâ&#x20AC;&#x2122;, lies at the cornerstone of teaching at Dumpton. academic excellence, creativity, hard work and spirituality, it is a simple message to remind staďŹ&#x20AC;, governors and friends of its ethos to provide its pupils aged between 1 and 16, an excellent all-round education in a nurturing but challenging environment. The Shoe Tree has been based in Wimborne for over 36 years We are Startrite childrens ďŹ tting specialists and also stock Padders mens and ladies shoes and slippers. A full range of width ďŹ ttings are always in stock to suit most feet. Special Customer Loyalty Cards are available and give regular customers money off childrens shoes. Shoe Tree proudly supports the â&#x20AC;&#x2DC;Shoe Recycling Schemeâ&#x20AC;&#x2122; in aid of the Variety Club. there is much more one-to-one teacher/pupil time, and much less time spent in meetings. There is a caveat to this, though, in that you are much more likely to spend time as a minibus driver. There are other differences: at an independent school, you're more likely to be educating the offspring of pop-stars who, like their parents, range from the grounded to the prima donna. In parts of the state sector, the teachers may wish for bodyguards, in more affluent parts of the independent sector, the children have bodyguards…, and a PA, and a nanny, and a chauffeur. Probably the greatest difference between the state and independent sectors, though, is in the field of ‘risk assessment’. In the independent sector, there is much more of a focus on staff and individual students taking responsibility for their own actions. So children will be told that if they get a conker on the knuckles it will hurt, but not issued with boxing gloves. Contrary to received wisdom, one area where the state and private sectors are quite similar is in terms of trips, particularly skiing trips. On these excursions it is not the teachers who are in charge, rather it is the ski instructors at the resort (and their friends in the medical insurance sector). This means that, in the event of a student getting injured by falling from, or being hit by, a chairlift, or contriving to hit – at full speed – the only wooden post in a 200-metre-wide nursery slope, then, by the time the resort employees have managed to wrap the offending post in hi-viz padding (and taken pictures of it so wrapped for their insurance company), the teacher will only just have had time (while breaking a personal best) to get down the mountain on a black run before the ski instructor-ordered, and enormously expensive, precautionary med-evac helicopter takes off. Other issues that span the independent/state divide are the mystical ability some teachers possess, and others lack, to impose silence on a room by their mere arrival… in the independent sector, however, it is certainly helped by the reciprocal respect between teacher and pupil… and the relative ease with which independent schools can be rid of troublemakers. By and large, though, whilst children are full of surprises, which is the main reason why we all go into teaching and stay there, they are largely pleasant ones. Ballard School can offer your child â&#x20AC;&#x201C; everyone is welcome at our open mornings and there is no need to register in advance. 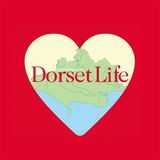 From the makers of Dorset Life, The Best in Education looks at everything parents need to know to choose a school and much, much more.